If you haven’t noticed over the past few days, there has been a lack of new Daily iLife videos. We apologize for the inconvenience, however we at theiLife.com are very busy preparing for Macworld 2008 and writing other daily content. Sorry for the delay, hang in tight: The Daily iLife will be back during Macworld with whatever new videos Sir Steve gives us- we promise! After the catastrophic realization that Apple would be switching its processor architecture over to x86, Macintosh fans everywhere have to get used to a new approach to product releases. While the PowerPC architecture was limited to a few models, and was updated annually at best, the Intel roadmap looks like something out of a horror movie to the dedicated Mac head. Apple has responded to Intel’s somewhat convoluted release schedule by shying away from timing product launches with hardware changes. The update from Core to Core 2 for example, was non event, the Apple store was updated and that was that. This policy sets a new tone for product releases, and as such, has the added benefit for Apple in making their product releases harder to pinpoint. It may be hard to say when a product will be updated, but the architecture that will go into the upcoming notebooks is no secret. At CES in January, Intel will show off its brand new 45nm mobile family, codenamed Penryn. This family of processors is the successor to the Merom and Conroe mobile chipsets that were the foundation for the first mobile Core 2 chips. Penryn will have a host of new features, but its role is more evolutionary than revolutionary when compared with the previous jump from the Pentium M/Yonah family of processors to Conroe. The next major revision to the Intel architecture is Nehalem, tentatively scheduled for a late 2008 release. For now, the Penryn family of processors will see a tremendous improvement in power consumption (a benefit of is 45nm architecture and smaller memory die), cache size (with the high end models having as much as 12mb) and SSE4 processing instructions (which will greatly increase the speed of activities such as video encoding with the proper software optimization). The desktop version of Penyrn, called Wolfsdale will be released shortly after the mobile one, sometime in February. A third variant, Yorksfield is a quad-core variant that may see service in Apple’s Mac Pro line, though so far, that product has been exclusively tied to Intel’s Xeon server chipsets in an attempt to boost power and distinguish it from consumer products. Performance increase in this series will probably be slight at best and negligible at worst. Unless a program has been optimized for the new SSE4 instructions (DivX is one such program), Penryn has anywhere from a 1% to 10% gain over its Merom/Conroe predecessor at similar clock speeds. For mobile products however, the lower power consumption will result in improved battery times and improved heat management. It is entirely possible that a MacBook Pro update could be announced at Macworld, but with the sheer volume of other possible, and the ambiguous launch date of Penyrn based products, it is far from guaranteed. For the coming days leading up to Macworld, I will be releasing a series of articles focused on specific rumors slated for Macworld 2008. Todays article is about the rumored ‘ultra-portable’ laptop. Probably the biggest rumor going for Macworld this year has to be the ‘ultra-portable’ MacBook. The rumor has been floating around for years, resurfacing many times over the years! In 2003, ‘The Year of the Notebook’, Apple introduced a 12″ and 17″ PowerBook to diversify the lineup. Going way back, the PowerBook 2400 was considered a true ‘ultra-portable’ and included an external Floppy drive. Now more than ever, the rumor seems realistic except- Steve Jobs doesn’t like having of external optical drives. But, this doesn’t mean that the rumor is out- just because Jobs doesn’t like something does not mean that it won’t happen! Also, this was a couple of years ago now! 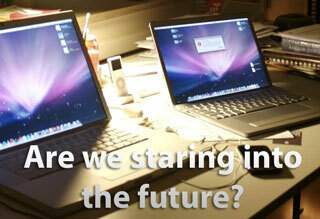 I think that in Macworld we will definitely see new laptops of some kind. Whether they are ‘ultra-portable’, I can’t say for sure. It is true, that if you look at (or open up) a MacBook Pro, you can see that almost a quarter of the surface area is taken up with the optical drive- and lets face it: physical media is on its way out! Just like Jobs cut ADB for USB or Floppy disks, we can be certain that in the future (maybe the near one) we will no longer have optical drives. However, at this point in time, I think an optional external optical drive isn’t ideal- and I think Apple agrees at this point in time, unless this new laptop is dirt cheap. ($599? $699? $799)?